Located in the foothills of La Manga Club resort, El Rancho is a small community of beautifully rustic villas that provides the perfect setting for your 2018 holiday in this unique part or Spain. With a choice of two and three bedroom townhouses, the well appointed, self-catering properties offer spacious, open plan living, suitable for families, groups of friends and couples. This charming three bedroom townhouse is a home away from home; it oozes comfort whilst simultaneously being within easy reach of all of all the facilities offered on the resort. All the beautifully designed townhouses have terraces or a balcony so you can enjoy dining ‘alfresco’, and the community has nine swimming pools - each with its own paddling pool - for the exclusive use of guests. For those who want more, La Manga’s main swimming pool, Oasis, is within easy walking distance. The El Rancho community is the perfect holiday destination if you want to relax and soak up the abundant Murcia sunshine, cooling off with the occasional dip in the pool. If you also want to enjoy your favourite sports or activity - or try one for the first time - there is plenty to choose from, and all of it right on your doorstep. With three championship golf courses, first class tennis courts, squash courts, bowling greens, spa, gym, jogging routes, scuba diving, football academy, dance academy, and more, there really is something for everyone. You’re only a five minute walk to the nearest supermarket, and many of La Manga’s great clubs, bars, and restaurants are also within easy walking distance. 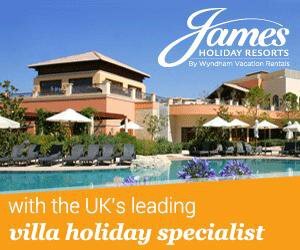 The resort itself, is only a twenty minute drive from Murcia Airport, and an hour by car from Alicante Airport. More El Rancho accommodation* available at from only £65 per night.